Fine bread particles that are used in cooking to coat food and give it a crispy texture. Bread crumbs are made from ground stale bread. Flavors: bland/mild, slightly nutty, sometimes salty. 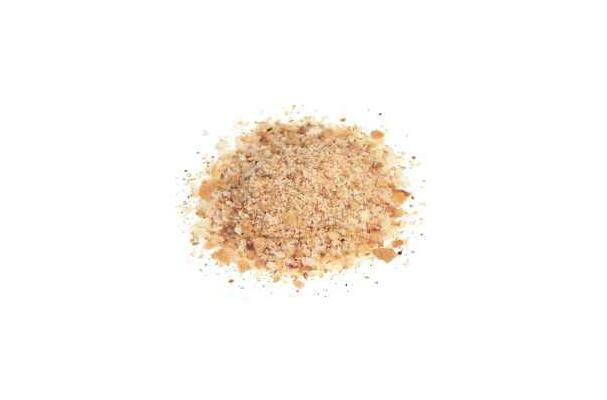 Bread crumbs are often used as breading for deep-fried and sauteed food. It can also be used as a filler for meatloaf, meat balls, quiche, or puddings. Bread crumbs can be stored in airtight containers in a cool, dry place. They should be consumed within a week. It is best to make them fresh when you need to use them. Commercially made bread crumbs have expiration dates to know when it is best consumed.